16 players on 1/2 to 2/3 of the field. Attacking team in Red resemble a 4-3-3 formation with 6 attackers only vs Defending team in Blue resembling a team in a 4-4-2 formation. Blue players &apos;A&apos; & &apos;B&apos; track back to defend when the ball is on the opposite side of the field. Blue team attacks the 2 main goals at centre on gaining posession. 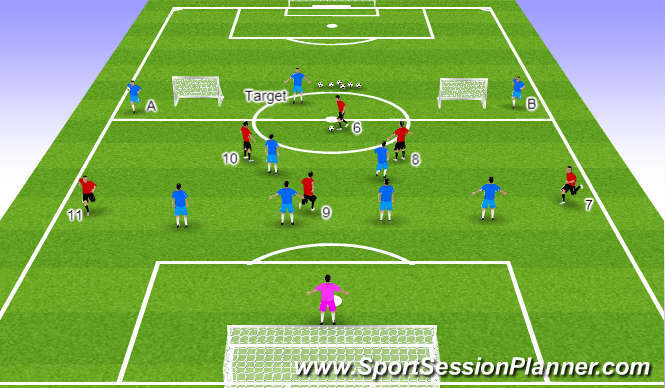 Must play the target (&apos;T&apos;) player in the centre receive a return pass to any blue player & score into the goals. (This encourages transition and support when playing forward). Red MDF #6 receives possession from &apos;T&apos; (Defending Back 4 & MDF 2 adjust to where they should be when &apos;T&apos; has the ball & prepares to play to #6. Attackers must assess the pressure on the ball and get into supporting or penetrating positions (between, behind, around defenders and lines of defense). Player &apos;A&apos; & &apos;B&apos; must be prepared to get bak into defensive position when the ball is on the opposite side. Target player aways starts the play after a goal is scored. Allow players to adust their positioning. Attacking MDF players open up to be sideways on (1/2 turned) & create space centrally to play to #9 who makes him/herself availble to receive 1/2 turned. Another option in this play is if the striker can&apos;t play a pass to #10 / #8 who move forward to break the line, #6 shows for the ball in front of #9 and plays a pass through or over the defenders into the box. Wingers offer the option wide if the ball can not be played centrally or if the defenders get compact to soon. Attacking players of quality are those who can get turned and look to play forward. #10 gets turned and looks to combine a wall pass with #9. Play forward get forward to break the lines. This works well when the attacking MDF on the same side as the CB marking the Striker is forced to make a decision to stay or move with the striker. It will also force the MDF marking #10 to make a decision, as well as the FB to tuck in or stay out wide. If the wall pass is not possible then #6 or #8 make themselves available and they can receive the pass from #9 and play through to #10 breaking the line (3rd man run). Wingers offer the addiitonal option if the FB tucks in to far or even to play to their feet to be in a 1vs1 situation out wide when central attack is denied. 1. Attacking MDF&apos;s create space for the Striker to receive the pass (1/2 Turned to shield) to see if s/he can turn and attack the goal alone. 5. 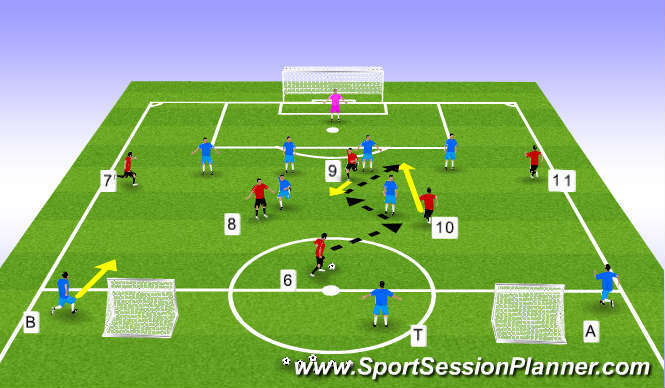 Force defenders to make decisions when making a run to penetrate or to support the player on the ball.